As Neil Young’s self imposed 2017 sabbatical continues, we learn that innovators never sleep. 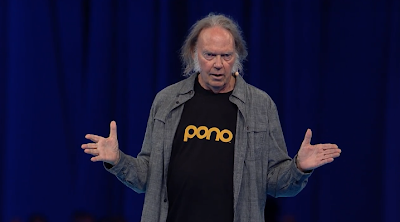 While it may appear that Pono has gone defunct, that does not seem to be the case as Neil continues to evolve the Pono product into a high-resolution music streaming service. "It's time to talk about Pono," the Canadian singer, musician and activist wrote in a lengthy missive that seemed to indicate an end to the online storefront — which has been offline since July 2016 — and posted to the Pono community website Thursday evening. "I'm still trying to make the case for bringing you the best music possible, at a reasonable price, the same message we brought to you five years ago. I don't know whether we will succeed, but it's still as important to us as it ever was." "Our player won best digital portable product of the year from Stereophile Magazine, and we offered some of the best high-resolution content to be found anywhere. We sold tens of thousands of players, every unit that we made," he said. In 2016, upon the demise of Pono music store partner Omnifone, "we began work with another company to build the same download store. But the more we worked on it, the more we realized how difficult it would be to recreate what we had and how costly it was to run it," Young wrote. "I also realized that just bringing back the store was not enough. While there was a dedicated audience, I could not in good conscience continue to justify the higher costs. When it comes to high-res, the record industry is still broken," he said, explaining that record companies charge a premium for the sale of high-res recordings. "I believe all music should cost the same, regardless of the technology used." He shared more details in his post, revealing that he's teamed up with Singapore firm Orastream to create "an adaptive streaming service that changes with available bandwidth" for "complete high-resolution playback." They've dubbed the service Xstream. "For more than eight months, I've been working with our small team to look for alternatives. Finding a way to deliver the quality music without the expense and to bring it to a larger audience has been our goal," Young said. Young added that "every recording I have ever released will soon be available in Xstream high-resolution quality at my complete online archive." Read Neil Young’s full statement on Xstream. It’s time to talk about Pono and the initiative we all started. As you know, together we’ve been fighting a battle to bring high quality music back to the world that’s become used to mediocre, hollowed-out files. The cause seemed to be a win-win for everyone. The artists would allow their fans to hear what they hear in the studios, and the music lovers would hear the music the best it could be. This cause has been something I’ve written and talked about for over 20 years. I cared and I assumed that most of the world would care. It’s been almost five years since we kicked off the campaign at SXSW to offer a player and download content that could fulfill my dream of bringing to you a music experience unlike any other for the cost. Thanks to our supporters on Kickstarter, the follow-on customers and some very good friends that supported the effort, we delivered on that promise. Our player won best digital portable product of the year from Stereophile Magazine, and we offered some of the best high resolution content to be found anywhere. We sold tens of thousands of players, every unit that we made. Thanks for that! But, despite that success, I was not satisfied. I had to put up with lots of criticism for the high cost of music delivered in the way all music should be provided, at full resolution and not hollowed out. I had no control over the pricing, but I was the one that felt the criticism, because I was the face of it. And I pretty much agreed with the criticism. Music should not be priced this way. Last year when Omnifone, our download store partner, was bought and shut down with no notice by Apple, we began work with another company to build the same download store. But the more we worked on it, the more we realized how difficult it would be to recreate what we had and how costly it was to run it: to deliver the Pono promise, meaning you’d never have to buy the same album again if was released at a higher quality; the ability to access just high res music, and not the same performances at lower quality, and the ability to do special sales. Each of these features was expensive to implement. I also realized that just bringing back the store was not enough. While there was a dedicated audience, I could not in good conscience continue to justify the higher costs. When it comes to high res, the record industry is still broken. The industry was such that even when I wanted to remaster some of the great performances from my artist friends at high res, Pono had to pay thousands of dollars for each recording, with little expectation of getting the money back. Record companies believe they should charge a premium for high res recordings and conversely, I believe all music should cost the same, regardless of the technology used. That effort has led to a technology developed by Orastream, a small company in Singapore that we’ve been working with. Together we created Xstream, the next generation of streaming, an adaptive streaming service that changes with available bandwidth. It is absolutely amazing because it is capable of complete high resolution playback. Unlike all other streaming services that are limited to playing at a single low or moderate resolution, Xstream plays at the highest quality your network condition allows at that moment and adapts as the network conditions change. It’s a single high resolution bit-perfect file that essentially compresses as needed to never stop playing. As a result, it always sounds better than the other streaming services and it never stops or buffers like other higher res services. When you play it at home with WiFi it can play all established low and high resolutions, including the highest, and thousands more levels of resolution in between. When you are in your car with poor cellular it might play better than an existing low res service, but at a location where robust wifi is available Xstream supports high resolution listening. Xstream is one file, streaming for all with 15,000 seamlessly changing levels of playback quality. So, this is what we’ve been working on. But one of my conditions is that it should not have a premium price. I’ve insisted that there be no premium price for this service. Pono tried that with downloads and it’s not a good model for customers. And I’ve told the labels it’s not a good model for them to charge a premium for music the way it was meant to be heard. I firmly believe that music is in trouble because you can’t hear it the way it is created unless you pay a premium. No one gets to hear the real deal, so the magic of music is compromised by limited technology. Good sounding music is not a premium. All songs should cost the same, regardless of digital resolution. Let the people decide what they want to listen to without charging them more for true quality. That way quality is not an elitist thing. If high resolution costs more, listeners will just choose the cheaper option and never hear the quality. Record companies will ultimately lose more money by not exposing the true beauty of their music to the masses. Remember, all music is created to sound great and the record labels are the one’s deciding to not offer that at the normal price. The magic of music should be presented by the stewards of that music at a normal price. Let listeners decide on the quality they want to purchase without pricing constraints. I’ve been meeting with and speaking with the labels, potential partners such as the carriers, and other potential investors. For many it’s a difficult sell. There are already streaming services, some doing well and others not. While there’s nothing as good as Xstream, or as flexible and adaptive, it’s still proven a difficult sell for companies to invest in. So, in my experience, today’s broken music industry continues to make major mistakes, but we are still trying. Bringing back the magic of great sound matters to the music of the world. Thank you all very much for supporting Pono and quality audio. Thanks to everyone who is or was associated with Pono, especially the customers who supported us. Thanks to Charlie Hansen and Ayre Acoustics for the great PonoPlayer. It has been a labor of love. I want you to know that I’m still trying to make the case for bringing you the best music possible, at a reasonable price, the same message we brought to you five years ago. I don’t know whether we will succeed, but it’s still as important to us as it ever was. Thankfully, for those of my audience who care and want to hear all the music, every recording I have ever released will soon be available in Xstream high resolution quality at my complete online archive. Check it out. We will be announcing it very soon. More on Neil Young's PONO and Music Vision. One thing's for sure: we need a new format. Or do we? Let's just pause for a second. Despite the message we've been brainwashing ourselves with. Before buying another music player, or another subscription, or another download, in that never-ending search for the perfect format that will fulfil the seductive promise of perfect audio. Let's ask: is this really going to improve our enjoyment that much? If so: great! But it's worth considering. Just to make sure we are not on a wild-goose chase. As for Pono, it's like the difference between drinking a vintage wine out of a sparkling crystal glass or a stained old coffee mug. The wine in the crystal glass is going to taste significantly better, be more savoured, despite being exactly the same stuff as what's in the coffee mug. It's psychological. A gourmet meal tastes better in a tastefully-lit restaurant than out of a fast-food container. We all instinctively know this to be true. And that's perfectly fine! In the fact, the container is an essential part of savouring the experience. And yes, mp3s (comparable to the coffee mug) ARE a lesser experience than putting on Pono, a vinyl record or even a CD (crystal glass). Because it's less engaging, less tactile, less REAL. In this respect I totally agree with Neil. We're both trying to address the same problem. I just disagree with his conclusions. Because I think he has mis-diagnosed the problem, chasing after imaginary improvements in sound resolution when the real problem is elsewhere. That's why his business is failing. And he refuses to listen to anyone trying to put this point across. And why take high-res audio or vinyl (crystal glass) and give it all the qualities of the metaphorical coffee mug (streaming audio, no album art, no physical product, soulless digital files, no "stature"). Surely that defeats the point? I like good sound, too. I love it. The problem is we've already got it, and we've had it for decades. Some of Neil's best-sounding albums were recorded in CD quality, many of them on vinyl, and most of his least-impressive in 24/192. So if there's a problem with enjoying music in 2017, it's clearly not in the sound resolution; it's somewhere else. So I hope he will consider that, before spending precious time on yet another untested format that we all know will be obsolete in another five years. In the meantime, your dusty CD copy of Sleeps With Angels still sounds fantastic. Might as well enjoy it. And of course, it's great to hear something from Mr Young, even If I disagree with him on the subject matter. His comments about pricing are welcomed, and I'll be glad to hear Archives 2, whatever the format. I disagree Scotsman, I want a DVD/cd version (ideally with a download card) in identically sized boxes so that when (if ever!) we get all four volumes of archives, it spells his name along the when they're placed side by side. Geeky but important! I fully agree with Thos. With archives 2 I want a physical thing that is MINE. One that I pay for once and listen to forever,and not have to subscribe on a long term basis. One that I can transfer to whatever device I like in whatever quality I like using whatever technology I like. Probably devices and technology I already have and more importantly TRUST. A thing that won't disappear when xstream fades away like pono. One that won't depend on internet access. One that will work on a plane, train or automobile. One that I can give to my children and say daddy thinks this is cool, look after it for me and give it to your kids. I obviously want the music, but I also I want the box. I want the CDs. I want the leatherette book. I want the poster. I don't want a crappy website that will fall by the way side when the hype dies down and the staff move on to the next project e.g. Pono, bluray downloads, etc. Thos, Peter D: basically I agree with both of you. I don't really understand the constant need to re-invent the wheel with regards to format. I thought Volume 1 was basically a success, and one worth continuining with to a similar blueprint. 'He shared more details in his post, revealing that he's teamed up with Singapore firm Orastream to create "an adaptive streaming service that changes with available bandwidth" for "complete high-resolution playback." They've dubbed the service Xstream' - when did listening to music get so complicated? Adaptive Streaming oh come on Neil keep it simple. I agree with Scotzman that the wheel is already here and I'm not interested in streaming my music. I bought a Blu Ray player specifically because of Archive Vol. 1. I am only interested in a physical product. Otherwise I'll pass.